Roller Derby is a fast-paced full contact team sport that requires speed, strategy, and athleticism. The flat track version of the sport went through a revival in 2001, and has quickly spawned more than 600 leagues worldwide. This is in large part due to the ease of setting up a flat track – it can be done on any flat surface that is suitable for skating, such as basketball courts, parking lots, and even airplane hangars. This greatly reduces the capital needed to start up a Roller Derby league, and allows small groups of people to get a fledgling league off the ground. The DIY spirit that drives the sport allows Roller Derby leagues to create their own unique identities and adapt their structures to reflect their local communities. A league is typically made up of two or more teams. Each team plays as part of the same league, but bout in competition against each other. Each team is made up of an assortment of skaters with differing skills and abilities. On each team, you will find both fast and agile skaters, as well as solid, hard hitting skaters. Both are extremely important to the game and no one body type is at an advantage or disadvantage in the sport. A game or bout is played between two opposing teams. A bout consists of two thirty minute halves with each half being broken down into two minute Jams. For each bout, up to 14 players can be registered for a team, but a team’s full lineup for a single jam will consist of five players – one pivot, three blockers and one jammer. Each team may field up to five players for each jam. Pivot – The pivot blocker wears a helmet cover with a stripe on it. They generally start at the first starting line and serve as the leader of their teammates playing in that jam. As most teams play the pivot position at the front of the pack, they are also often the last line of defense to stop the opposing jammer from escaping through the pack. Blocker – The other three blockers do not wear helmet covers. All blockers may play offense anddefense at any given time and frequently switch between offensive and defensive tasks. The rules do not differentiate between the remaining three blocking positions, however most Roller Derby teams choose to assign names and focus areas to the blocking positions for strategic purposes. Jammer – The jammer wears a helmet cover with a star on it. They line up at the second starting line and begin play at the second start whistle. The jammer’s goal is to pass opposing blockers and emerge from the pack as quickly as possible. 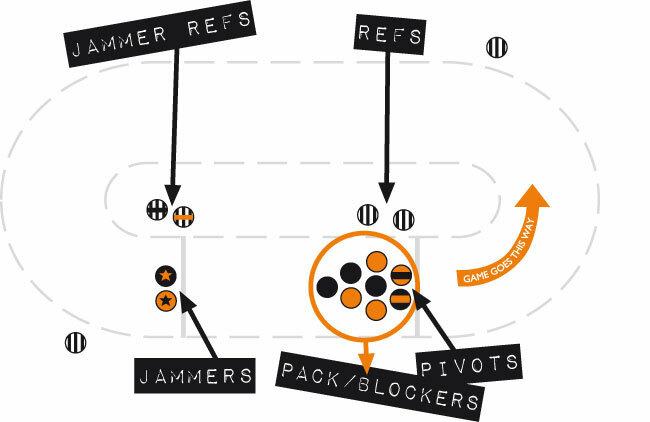 If they are the first of the two jammers to escape the pack without committing any penalties, they gain the strategic advantage of being able to stop the jam at any time by placing their hands on their hips.Once a jammer laps the pack, they begin scoring one point for every opposing blocker they pass legally. They can continue to lap the pack for additional scoring passes for the duration of the jam. The Jammer can also score points on opponents who are in the penalty box and can get a fifth point if they lap the opposing jammer. Blockers are trying to stop the opposing team’s jammer while helping their own jammer get through. Are there any rules or penalties? For all the rules and penalties, check out the official WFTDA Rules. • It is illegal to GRAB, HOLD or PULL an opposing player – so hands off! If a skater is in the penalty box and the jammer from the other team passes through the pack, they will still get a point for the missing skater who is in the penalty box. So the penalty is truly only against the team who is losing a player for that period of time and not against the other team who is trying to score points.